"Probably the best documentary ever made about American foreign policy". 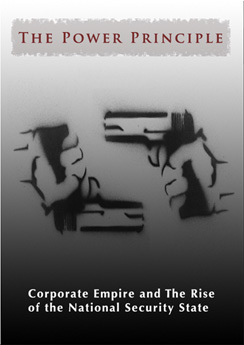 "A gripping, deeply informative account of the plunder, hypocrisy, and mass violence of plutocracy and empire; insightful, historically grounded and highly relevant to the events of today." "Remarkable...Scott Noble has taken an extremely complex history and transformed it into a highly comprehensible and moving film." "A Superb work, full of insight and compassion." "Brilliant...An Ideal educational resource for teachers, concerned citizens and public policy advocates." "The Power Principle is a remarkable achievement, a gripping assembly of archival footage, interviews and narrative that exposes the powers that be in the world and especially those who advance U.S. empire, their lies and deceit, their crimes, and the havoc they are wracking on humanity and the planet. This is an ideal tool for use in classrooms and communities and for social justice movements seeking to inform and educate the public." Is Empire a Dirty Word? Harwell, Mark A. and Hutchinson, Thomas C.